As someone who teaches meditation, communication skills and brain science, and writes this blog about the importance of how we talk with one another, I felt chagrined and humbled. I got hijacked and lost track of my pause button. I really want to remember that I have the capacity to pause. Even with training, it’s easy to forget. So, I am making 2016 the year of pausing more. 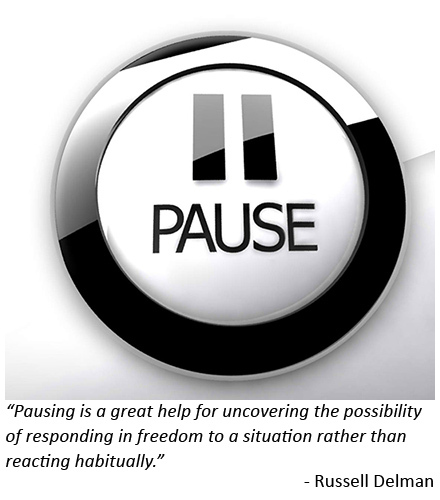 In a culture of go-go meetings, non-stop media and 24/7 online connection, why would anyone need to pause? Prevent or stop habitual “self-talk,” like criticizing myself for getting hijacked in the first place. Pausing is an intentional interruption of activity so we can notice the dynamic stream of body sensations, emotions and thoughts inside us. Doing this for three breaths (or counting to 10 slowly) usually slows the internal activity and opens up space in which we can choose how we want to respond to a situation rather than reacting habitually. I am more likely to remember to pause when I meditate and exercise regularly. Both of these create an inner atmosphere in which it is easier to pause; and for our bodies to return to or remain at a more human and considered pace. This year I intend to not to go too long without pausing as I work at my desk, stand washing dishes, and talk in meetings with others. No one needs to know I am doing this. Try it right now: shift your attention to your breath, the sensations of your body on the chair, your feet on the floor, and notice your internal atmosphere. How is it “in there” right now?